An industry leader in Seattle, Genesee Heat hired Train of Thought to redesign and rewrite their website. The old site lacked in relevant content and intuitive navigation, and in an overall sense did not reflect the brand’s status. 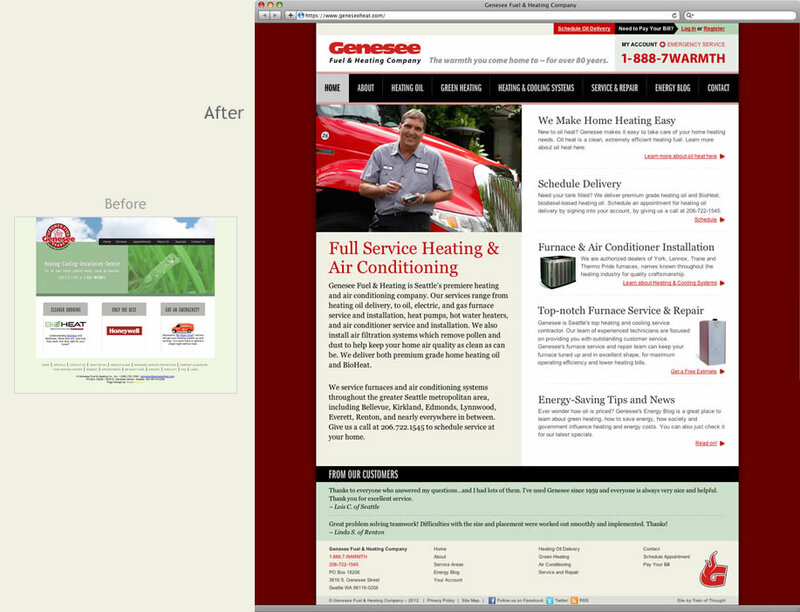 Our redesign catapulted the site to the industry-leading position Genesee deserved. Read how we did it below. For starters, we looked at the company’s offerings from a holistic standpoint. Our approach to search engine optimization (SEO) has always been different. Instead of leaping from trend to trend, we focus entirely on creating valuable content that helps people connect with the services they need. Over time, search engines have come to see this approach – our focus on providing valuable content, rather than over-stacking keywords and finding algorithm loopholes – as the most valuable. We make it as easy as possible for people to learn, connect, and make choices. Examining user data showed what people used on the previous site, but it did not reflect the company’s most prominent and popular offerings. Once we determined the content strategy should be focused on personal interviews and reality rather than data, creating the site’s design, content, and flow became intuitive. Since Genesee is a tight team of people, run much like a family, we art directed an on-location photo shoot of the staff that people are most likely to come into contact with – the drivers, as well as a portraiture session with the photo-shy owner, and we sourced affordable stock photography that represented the brand well. The on-brand photography helped transform the type of connections people could forge with the company on the new website. The new site was personally engaging, much more visual, with relevant content, and intuitive navigation. The end result was a swift leap to several top 3 Google rankings, an enduring industry-leading modern design, and an easy-to-update site. We particularly enjoyed the photo shoots because the owner and staff turned out to be much more photogenic than they thought. The best customer connections are with real people, and the professional photos help make that happen.